(CNN) - Rep. Steve King dismissed suggestions that racial profiling has played a role in clashes between police and protesters in Ferguson, Missouri, after the shooting of an unarmed teen. In an interview on Wednesday with the conservative network Newsmax TV, the conservative Republican congressman suggested, based on video he's seen of demonstrations in the St. Louis suburb, that racial profiling isn't a factor because all of the protesters are of the same "continental origin." 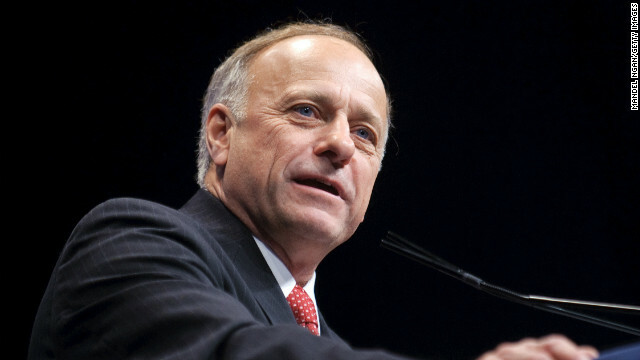 Okoboji, Iowa (CNN) – Republican Rep. Steve King was confronted Monday night at his own fundraiser by an undocumented immigrant and activist who argued with the Iowa congressman over his stance on immigration. Erika Andiola, who’s involved with the Arizona DREAM Act Coalition, mostly took issue with King’s vote last week to curb the Deferred Action for Childhood Arrivals (DACA) program that allows certain young people - who were brought to the U.S. illegally as children - to delay deportation. (CNN) - It may not fly with those imagining Santa with magical ones on Christmas Day, but a U.S. lawmaker decided to share with the world that one reindeer - in part, anyway - ended up on his plate. "From Oslo, Merry Christmas season to my Scandinavian friends. 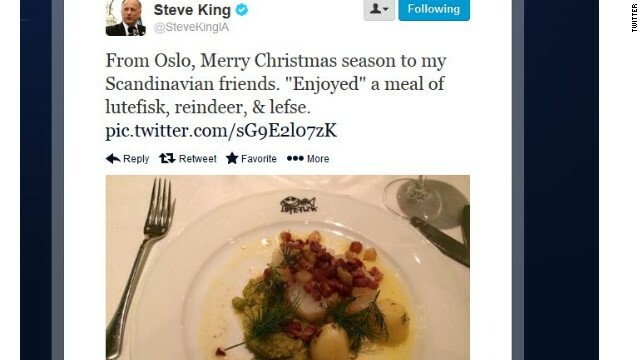 'Enjoyed' a meal of lutefisk, reindeer, & lefse," Rep. Steve King, R-Iowa, tweeted. 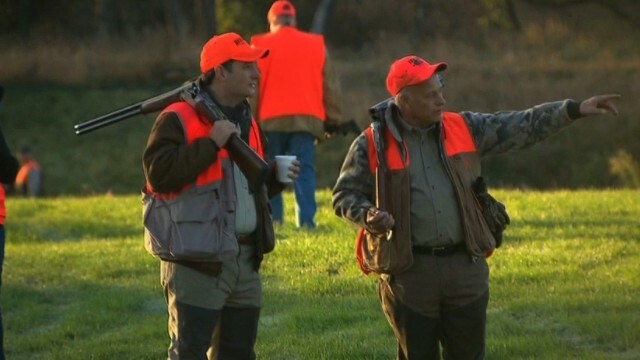 (CNN) - Decked out in blaze orange and tan hunting gear with a coffee in one hand and a shotgun in the other, tea party favorite Texas Sen. Ted Cruz took his anti-Washington establishment tune to the Hawkeye state Saturday morning, pheasant hunting on opening day with GOP Rep. Steve King. Health and Human Services Secretary Kathleen Sebelius should “absolutely” step down, Cruz said, perched at the bar at the Hole N' the Wall Lodge in Akron, Iowa, eating eggs and answering questions from journalists before the hunt. Washington (CNN) – Republican Rep. Steve King said he doubts any vote in the House to end the government shutdown and raise the debt limit will include legislation he can support, and reiterated his stance that Thursday's deadline to avoid default is nothing more than a date "picked on a calendar." In an interview on CNN's "New Day" Wednesday, King said conservatives must continue to dig in and insist that any deal include long-term entitlement reform and a balanced budget amendment to the Constitution, two requests that are highly unlikely to make it into any agreement. Stephanie Cutter debates with Rep. Steve King and Rep. Donna Edwards about Congress doing its job regarding the shutdown. (CNN) - Rep. Steve King, R-Iowa, reiterated his stance Thursday that President Barack Obama is "spiteful" and blamed him for the closure of the World War II Memorial in Washington, D.C.
"This is a spiteful president...and the American people need to understand that," King said on CNN's "Newsroom." (CNN) – Leaders in his party have been blinded to the consequences of immigration reform by the potential for gaining votes among Latinos, Rep. Steve King claimed in an interview Thursday. Speaking to Kate Bolduan on CNN's "New Day," King said the push to overhaul the nation's immigration system was being adopted by Republicans, despite their opposition in the past to similar efforts. Washington (CNN) – Iowa Rep. Steve King, whose hard line immigration rhetoric has angered some of his fellow Republicans and delighted Democrats eager to keep Hispanic voters in their fold, is quietly planning meetings with political activists in the early presidential primary state of South Carolina, CNN has learned. King will travel to the state in late August to attend the Charleston Meeting, a closed-door gathering of right-leaning politicians and business leaders organized by author and activist Mallory Factor, two Republican sources said. 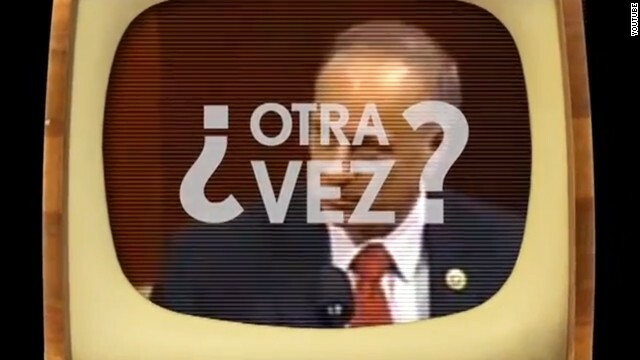 Washington (CNN) - A major union pushing for immigration reform will launch a new Spanish-language online ad campaign on Monday that highlights comments by Republican Rep. Steve King of Iowa, which were widely condemned as reprehensible because he portrayed many of the children of undocumented immigrants as drug traffickers.